To give more power to Arduino board DAC (Digital to Analog Converter) interfaced through breakout board and detailed Arduino DAC Tutorial given in this article for the best understanding. Here DAC IC MCP4725 based breakout board is used because it is 12-Bit Digital-to-Analog Converter with EEPROM Memory, this IC utilize low power and gives high accuracy output. This IC comes in sot package hence better to go with breakout board in this tutorial we used Sparkfun I2C Breakout MCP4725 board. By using this board we can obtain Analog voltage from Arduino board depends on the digital input and it accepts input in I2C format. This IC provides 12 bit resolution and on board Board Non-Volatile Memory (EEPROM). It can be addressed by external A0 address pin, and operates in Normal or Power-Down Mode. It takes wide range of input supply voltage as 2.7V to 5.5V from single supply source. This IC provides eight address through I2C and have Extended Temperature Range: -40°C to +125°C. Connect 5V pin and GND pin of Arduino board to Breakout board VCC and GND pin then connect A4 (SDA), A5 (SCL) pins with corresponding I2C pin of MCP 4725 brakout board. 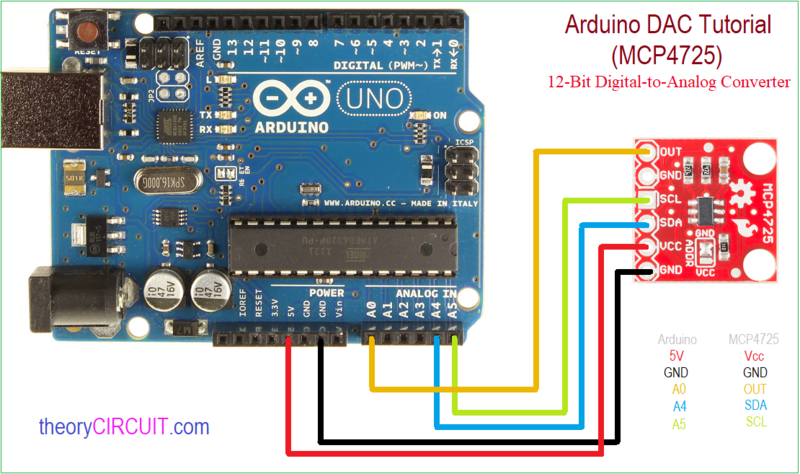 If you using other Arduino board then refer and use the corresponding I2C pins. Output pin of MCP4725 is connected with Analog pin A0 by the way we can measure and display the Analog voltage obtained from MCP4725 in serial monitor, you can also measure by using digital voltmeter or multimeter. MCP4725 Arduino Library from Adafruit. MCP4725 Breakout board from Sparkfun.